Edertal/Germany, Sep. 6, 2015. 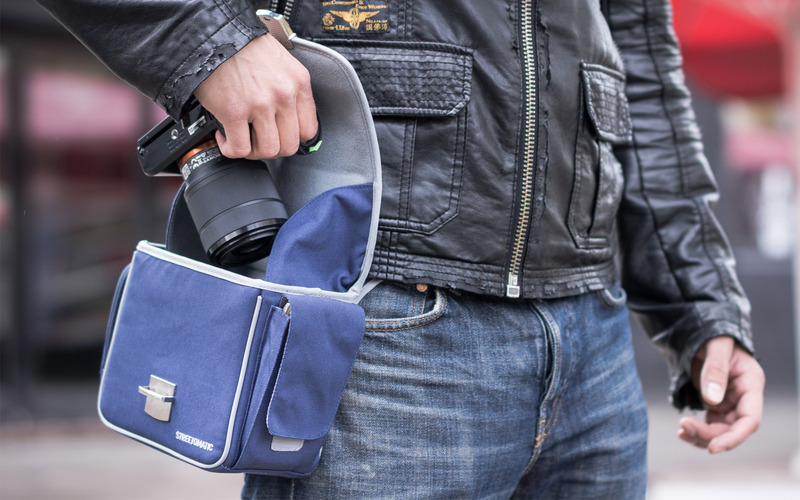 The CAMSLINGER Streetomatic by COSYSPEED GmbH of Edertal/Germany is a next-generation camera bag concept combining the speed and convenience of a sling strap with the safety and space of a camera bag. It can be worn comfortably around the hip or like a traditional sling bag over the shoulder. Quick, one-handed access, protection against rain, bumps, dust and views as well as its very high wearing comfort make the CAMSLINGER Streetomatic the ideal camera bag for street photographers and travellers. COSYSPEED GmbH has teamed up with renowned street photographer Thomas Leuthard (thomas.leuthard.photography) of Switzerland to design a camera bag that fits the needs of street photographers. The company set out to raise US-$ 17,500 on crowdfunding platform Indiegogo to produce the first batch of their latest innovation that is going to change the way street photographers carry their gear. While the CAMSLINGER Streetomatic was initially designed specifically for mirrorless cameras, it is also ideally suited for DSLRs and superzoom cameras. It is made out of durable and water resistant NYLON D600 fabric and comes in blue, khaki or black colours with a built-in rain cover, four department dividers as well as a free FINGERCAMSTRAP. The CAMSLINGER Streetomatic has a fixed belt and moves freely around the waist for maximum comfort. The black version of the CAMSLINGER Streetomatic is branded Thomas Leuthard Edition, with the signature of the popular street photographer stitched onto the front of the bag. For each edition bag sold, US-$ 10 will be donated to a care project for street kids in Burundi, supervised by German organisation Burundikids e.V. (w​ww.burundikids.org)​. The donations will be used to provide school supplies to 80 children in a centre for street kids in the country’s capital Bujumbura. US-$ 69), the CAMSLINGER Streetomatic Thomas Leuthard Edition for US-$ 65 (retail price: US-$ 79). Cosyspeed GmbH of Edertal/Germany is the first company in the world that specialises exclusively in accessories for mirrorless cameras. All products are developed in Germany and are subject to strict German quality criteria. Production is carried out in Germany, Europe, Asia and Africa. Focusing on convenient and functional accessories for the daily routine of photographers using mirrorless cameras, Cosyspeed is concentrating deliberately on the new technology of the future in the area of digital cameras. With the CAMPILLOW, COSYSPEED GmbH is also supporting a development aid project in Burundi/Africa. COSYSPEED is planning to transition into a not-for-profit company in 2016. I tested and reviewed the original Cosyspeed Camslinger and will have a review sample of the new one soon. The streetomatic seems to be an improved design for street photography, and while the original was awesome for street, the new one appears to not only be better but the price is quite amazing at $69 US. See the video below of me using the original Camslinger in Las Vegas last year! I welcome a new Site Sponsor, COSYSPEED. Olympus E-M10 II and 7-14 in the house! Review coming soon! I love your pictures! Send more with your Leica M246.